I couldn't help myself. I was going through LHN withdrawals. :) I ended up starting "The Sampler Lady" yesterday. "My Needle's Work" lady needed a friend. 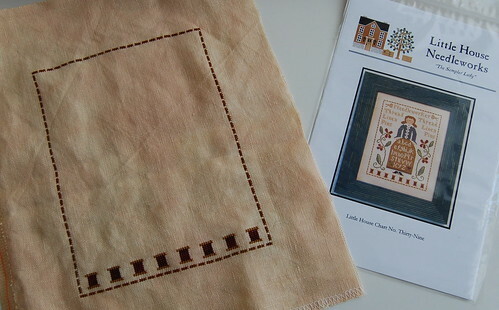 Little House Needleworks "The Sampler Lady" stitched on 32 ct. Vintage Luna. My favourite patterns LHN_needlework! Very nice! You are "super-stitcher!" How do you do it? You're off to a great start, Nicole! I'm really glad to hear John Adams was good. I am recording all of the episodes on my DVR. I'm trying to decide if I want to watch them as they come on or wait until I have all 7 episodes and then just take a weekend and watch them all at once. That's really a lovely design!! Great start!! Very pretty, Nicole! I don't have this one in my stash, but I'm sure after seeing your finish (probably in the next day or so), I'm going to want to add it to my stash! I wish I had HBO - I had it when I was in my other place, but don't have it where I'm at now - I really would like to see the John Adams mini-series. I love this one! It's also in my stash waiting for some fabric. Can't wait to see your end result (which I know won't be long). Btw - thanks for letting me know what you did about Weeping Willow for MNW.